Wright Medical: The Beginning of a Turnaround? Wright Medical Group N.V. (NASDAQ: WMGI) is a mid-cap medical device company that competes in the orthopedics market with a focus on the upper extremities, lower extremities and biologics product areas. Key products include their INFINITY total ankle system, SIMPLICITI shoulder system, and AUGMENT bone graft. According to management, Wright has a total addressable market size of $8 billion and serves the fastest-growing markets in the orthopedic space. In June 2018, Wright received FDA approval for their AUGMENT Injectable Bone Graft and launched their new PROstep System shortly thereafter. At the time, some analysts questioned Wright Medical’s valuation and downgraded the stock in July, arguing for limited upside in the stock price and revenue beats moving forward. However, in early August, Wright reported a strong beat on Q2 2018 earnings and raised their full-year revenue guidance, which led other analysts to upgrade the stock. In addition, Wright announced the acquisition of Cartiva, whose sales are expected to grow 50% y/y in 2018 and has the only PMA-approved polymer implant for the treatment of great toe osteoarthritis. How will investors be able to track the WMGI’s progress with these new product launches, as well as Cartiva’s continued growth, as they evaluate whether to buy or sell the stock? Guidepoint Qsight is a new dataset that compiles monthly purchasing data from over 1,500 U.S. hospitals in near real-time. 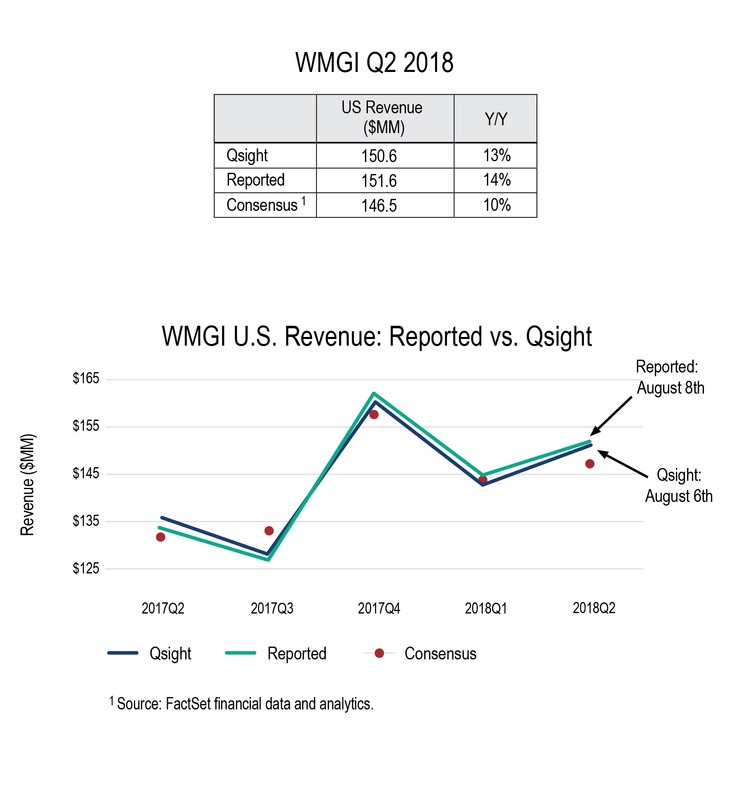 Prior to Wright’s Q2 2018 earnings release, Qsight’s data and projection methodology showed potential for their U.S. revenue to come in above sell-side consensus estimates. On August 8th, Wright’s Q2 2018 reported U.S. sales outperformed Street expectations, sending the stock price up +7% the next day. As an existing or potential shareholder in Wright Medical, why would you not want access to real-time data on its key products, acquisitions and growth?